I am pretty traditional when it comes to serving dinner at the table or any meal as a matter of fact. I like for us as a family to enjoy dinner together. It is one time during the day that we can come together and enjoy a good meal. Sure the kids are sometimes more interested in feeding their food to the dogs or would rather be running around but for me it’s about family time. Ten or twenty minutes with no TV, cell phones or laptops. It is just family, food and conversation. When I was growing up I remember sitting at the kitchen table and not being excused until all my food was finished. I even remember like it was yesterday when I didn’t finish my peas and my mother made me sit at the table which felt like hours until all my peas were gone. I’m sure I finally finished them or I still may be sitting at that table. I want my young kids to grow up with those traditional values and know that meals are at the table, even if it means sitting at the table until they eat all their peas. Sure before we had kids Mr. Mother Thyme and I would curl up on the couch and eat dinner from time to time. There was even a time when I actually went to an office and worked all day. I would come home late from work leaving the weeknight cooking duties to Mr. Mother Thyme. Then I got lucky when we moved from Florida up North and I worked from home. I could multi-task by hunting down promoters, booking flights for DJ’s, instant messaging my boss and stirring a pot of soup, or whatever I was cooking that day all at the same time. During hectic days, or just a lazy curl up on the couch let dinner simmer kind of days I always love relying on my trusty old crock pot. 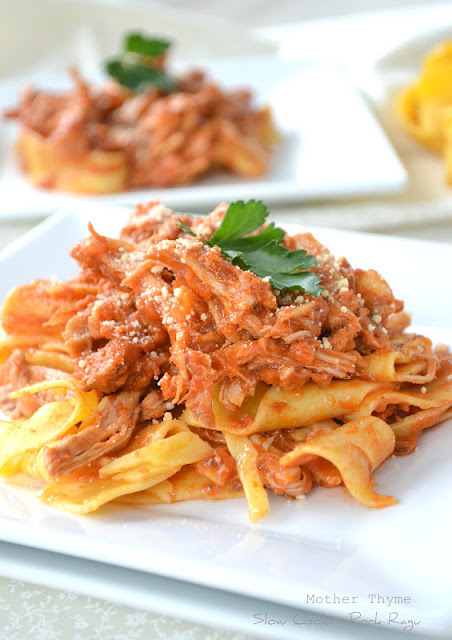 For this Pork Ragu I prefer cooking it in my crock pot which provides for such tender pork. After browning the pork which I tend to do with most meat before putting it in the crock pot, I top it with tomatoes, herbs some vegetables a splash of wine and broth and let it slowly cook all day. 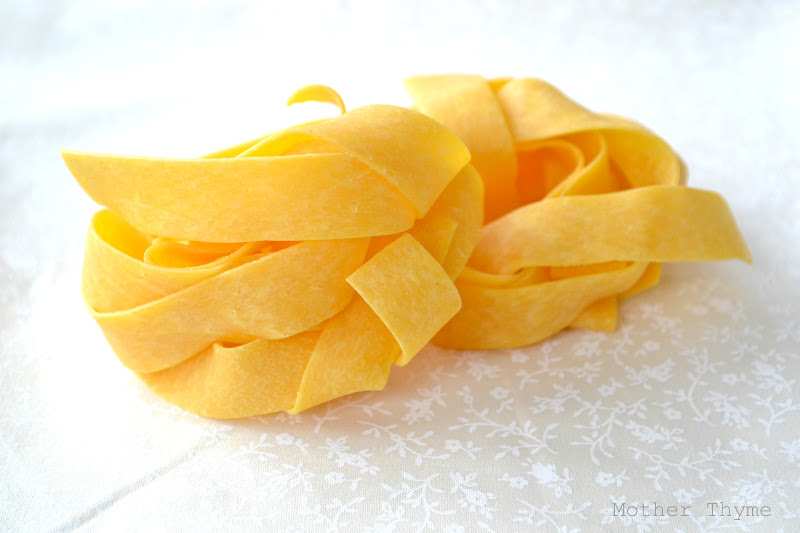 A thick hearty noodle such as pappardelle or a rigatoni is the perfect compliment to this very simple and rustic dish. Perfect for an enjoyable dinner around the table with the family. Heat olive oil in a large skillet or dutch oven over medium heat. Season pork loin with 1/2 teaspoon salt, 1/4 teaspoon pepper, rosemary and thyme. Brown all sides or pork, about 3-4 minutes per side. Spray non-stick cooking spray inside crock pot. Place pork inside crock port. Top pork with crushed tomatoes, chicken stock, onions, carrots, tomato paste, garlic, bay leaf, a splash of red wine and a dash of salt and pepper. Heat on low for 8 hours or high for 4-5 hours. When pork is cooked, using two forks roughly shred pork into large pieces. Remove bay leaf and place pork back into sauce, season with additional salt and pepper for taste. Turn heat to simmer/warm for an additional 30 minutes. Meanwhile boil a large pot of salted water on stovetop. Bring pasta to boil per package directions. 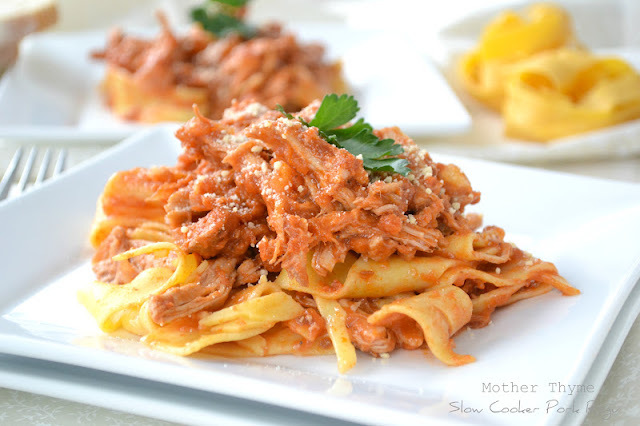 Toss pasta with pork and serve warm with top with fresh cheese and chopped fresh parsley. Check out my Shabby Fabric Wreath and Basic Fabric Rosette tutorial over at Mothertime Marketplace and Mother Thyme at Home today. I grew up the same way. We ate every meal at the table as a family and I plan on doing the same when I have a family of my own. My slow cooker would have to be one of my favourite appliances. It makes such tasty, tender meat. Oh wow Jennifer! How scrumptious! Good for you for being so good about family dinners. My hubby gets home way after the kiddos are in bed. I so wish we could those very important family dinners! Love love this recipe! This looks amazing, Jennifer! Family dinners are so important. We need to be better about not sitting in front of the TV while we eat. We ate at the dinner table last night and it was very enjoyable! Thanks for sharing this one! What a beautiful dish, Jennifer, and so simple too! Served over papardelle I bet this was really delicious. Thanks for sharing! You have a beautiful blog and I’m glad to have found it. In my crock pot right now! This looks so rich and amazing! This is delicious – I am going to convert this into a dutch oven recipe! It’s my dream to have family dinner around the table every night. My husband has a crazy work schedule, so he’s not usually home for dinner, but I try to sit down with my daughter and I every night. But it’s still a work in progress! This pork looks fantastic. I love a good slow cooker recipe! That is some tasty looking ragu! This looks delish! I like pork but the hubs is not the hugest fan…so I’m going to replace it with some beef! Thanks for sharing! This looks like perfect comfort food, yum! Thanks for sharing this recipe 😀 I think it’s time i got a crack pot! does this recipe call for a pork loin roast or a pork tenderloin? This recipe calls for a pork loin roast but you can substitute for a pork tenderloin if you prefer. Wow Jennifer, this looks and sounds amazing! We too have dinner at the table with no tv’s or cell phones. It’s all about the food and conversation with each other. The kids don’t seem to mind as they know it as “normal”. Thanks for sharing! Wow! That is a beautiful dish! My mouth’s watering just looking at the recipe and picture! Love it! OH yes – I couldn’t leave the table until my plate was clean either. The boiled okra had me sitting for hours. 🙂 Well, your Ragu would get eaten instantly! This sounds delicious and looks scrumptious! Looks so good. Gotta love the slow cooker!! Making this ragu as I am typing this. I added a little bit more garlic and onion than it calls for but everything else is exactly as it calls for. Can’t wait to try it. I followed your recipe, but was short on time so I used my new pressure cooker to make it. It was really delicious. Thankyou. The combination of ingredients is simply perfect! I’m hungry now! Looks great! I have a bone-in pork loan roast – do you think it would work the same way or would I need to adjust the time up or down? Hi Merrill! Yes, this would work with a bone-in roast as well. You should be fine with keeping it on low for 7-8 hours. The meat should be so tender and just fall off the bone once you pull it from your crock pot. Let me know how it turns out for you! I found this link on the Slow Cooker From Scratch website. This looks so delicious! I’m adding it to my meal plan for next week. I also took the time to read your About Me page and was interested to see that you live in Buffalo. I’m moving there next year with my boyfriend (he grew up in Buffalo but moved to Washington DC six years ago…that’s where we met). It’s always awesome to find soon-to-be local blogging contacts! Have you made this with chicken? Think breasts or thighs would be better? I have never made this recipe with chicken but I bet it would be great. I would stick with breasts to make this. Enjoy! have made this twice now in an 80’s crockpot i have just aquired. We love it! had the family over for the second time.. compliments came rolling in…!! so tender! so Delish!! thanks! I made this for dinner last night and it was amazing! This may be come the default pasta sauce in my house, but I think I’ll add a little more crushed tomatoes or tomato sauce next time. Thanks for the incredible recipe! Thanks Lauren! So happy you liked it! I made this in my crockpot today but instead of canned tomatoes I roasted a couple pounds of tomatoes from my mom’s garden and it was delicious! Loved this recipe. Pinned it too! Thanks for the recipe. It will definitely be added to our monthly calendar!